Brym, Robert, J., et al. Sociology Your Compass For A New World.Canada: Thompson Nelson. 2003. Welcome to the exciting world of sociology. Throughout this course you will be challenged to look at the world through sociological eyes. You will explore concepts sociologists use to examine the social world. Of importance, will be an in-depth analysis of how sociologists conduct research. Sociological concepts and the ways and end results of research will provide the background to explore such substantive areas as: culture, socialization, social structure, social interaction, social inequality, gender, race and ethnicity, aging, bureaucracy, the economy, politics, the family, education, religion, medicine, divorce, social control, population, urbanization, the environment, social movements and social change. Students are expected to attend class regularly and actively participate in class discussions. As well, reading assignments are to be completed and sources brought to class when requested. The reading list and dates and type of sources to be brought to class are attached to this syllabus. Introduction to Sociology Fall and Winter 2006 - 2007 Dr. Laurie Forbes Page 2. The examinations will incorporate lectures, class discussions, films and assigned readings. You will hand in two copies of a research proposal on November 10, 2006. One copy of your proposal will be kept on file and the other will be returned to you. Your proposal will be 2 to 3 pages in length, 12 font, and double-spaced. Late submissions will be penalized at the rate of 5 marks a day. Your proposal will indicate the topic you selected and define the problem you are investigating. After formulating a hypothesis you can choose the method you will use to conduct research (we will discuss methods in detail during lectures). Your proposal will clearly outline what you intend to explore in your research project, how you intend to go about conducting your research, and where you intend to gather your data. You will include the method you will use and why this method is appropriate for your study. Your proposal will be the template you use when conducting your research. From the week beginning January 8, 2007 until January 12, 2007 you will meet with Dr. Forbes to have your proposal approved. There will be a number of scheduled office hours for this purpose. These hours will be announced in class. Those who do not pick up their proposal during the week of January 8 - January 12 will be docked late marks. You cannot conduct research until you have been given verbal permission to do so. If you would like to begin working on your project early you may hand in your proposal early and I will be pleased to meet with you during regularly scheduled office hours to approve your topic. NO ASSIGNMENTS WILL BE HANDED IN ELECTRONICALLY. Your research project will be 6 to 8 pages in length, 12 font, and double-spaced. Late submissions will be penalized at the rate of 5 marks a day. Your research project will follow the template you established in your research proposal. To begin, explain why you have chosen the topic you did. Your project then will outline the problem you defined in your proposal. The next step is to note the hypothesis you developed in your proposal. A detailed explanation of the method you used and how you went about data collection is the next step. An analysis of data is then presented. Finally, some conclusions about what you found in your research will be drawn. You are to hand in any surveys or field notes with your project. The projects must be handed in to Dr. Forbes, in her office, on or before March 20, 2007. Introduction to Sociology Fall and Winter 2006 - 2007 Dr. Laurie Forbes Page 3. Your participation mark is based on your contribution to class discussions. This mark includes any requests to bring articles, etc. to class. These are to be read before class and summarized. Please Note: I do try to answer e-mail in a timely fashion. However, I only guarantee a response during my regularly scheduled office hours. I do not discuss marks through e-mail. How Sociologists see the world. Begin the sociological perspective. Visit a website and bring in an articleon a sociologist. Using the web, find the Professional Code of Ethics that sociologists follow when conducting research. Bring the article to class and be prepared to discuss the importance of ethics. Reading: article “Body Ritual Among the Nacirema” (On reserve in the library). 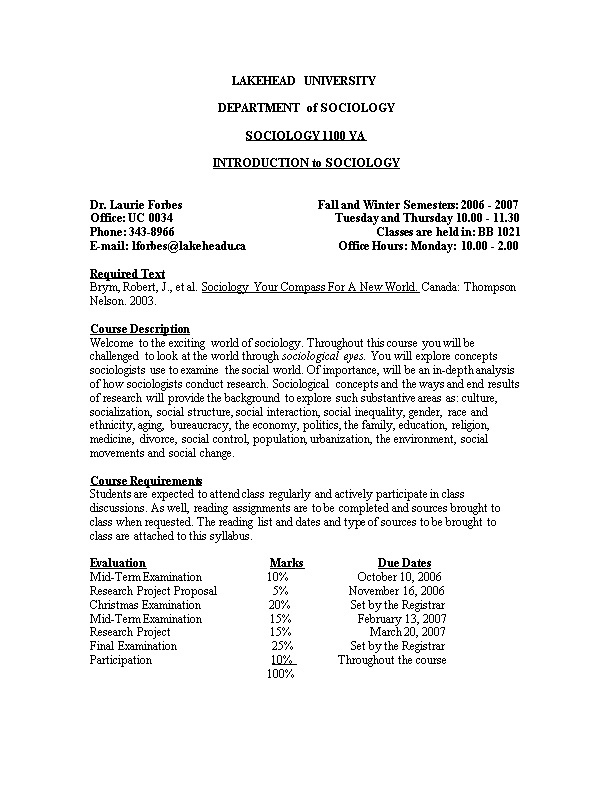 Introduction to Sociology Fall and Winter 2006 - 2007 Dr. Laurie Forbes Page 4. Each group will examine some aspect of Children’s Toys or Videos. Social Structure and Social Interaction. Identify an organization that is designed to help young people? What is the mandate of the organization? How does the organization meet their mandate? Bring in a hard copy of the mandate. Bring in a story or article that deals with some aspect of Halloween. Bring in a newspaper article on poverty in Canada. Introduction to Sociology Fall and Winter 2006 - 2007 Dr. Laurie Forbes Page 5. Film: Kanehsatake 270 Years of Rebellion continued. Discussion of film and Inequalities of Race and Ethnicity continued.